I build transistor gates a little different than most other electronics engineers. Most people when they build transistor gates; build them with only positive logic in mind, however gates in ICs have two logic's, positive logic and negative logic. And I build my transistor gates with positive and negative logic. Although there are eight gates; Buffer, Inverter or Not, And, Nand, Or, Nor, Xor, and Xnor, they are made from three gate circuits. And when you are building dual logic gates, the three circuits used to build a gate are Inverter or Not, Nand, and Nor, the rest of the gates are made from two or more of these three gates. Why build transistor gates? Well here are five reasons to build your own gates. 1. You haven’t got the gate you need. 2. You want a gate that carries more power than a standard gate IC. 3. You only want one gate and you hate wasting the rest of the gates on the IC. 4. Cost, a one transistor Inverter is less than $0.25 and a hex Inverter IC is $1.00 and up. 5. You want to understand gates better. The gates in this Instructable are ¼ watt gates if you want to build gates with a higher wattage you will need heaver wattage components. 3 x NPN general purpose transistors, I used 2N3904. 2 x PNP general purpose transistors, I used 2N3906. When you look up the truth table of a gate; such as a two input Or gate, you will get a truth table that looks like this. This is a positive truth table for an Or gate. Under A and B is the inputs to the gate and Q is the output. 1 represents logic value of 1 or + 5 volts and 0 represents a logic value of 0 or 0 volts. So when most people build a gate out of transistors they build it logic value of 1 or + 5 volts and logic value of 0 or no volts. But that isn’t what happens to the output of a gate, in an IC. When the output of a gate goes from logic value 1 to logic value 0 the output of that gate goes from + 5 volts with the current flowing out of the output to 0 volts with the current flowing into the output of the gate. The current reverses direction. When you use the reversed current flow this is called negative logic where 0 volts is – 1 logic value and + 5 volts is – 0 logic value. It is easiest to see what this does is when you connect the output of any gate; to the base of a NPN transistor and a PNP transistor, in series with an LED. While the output of the gate is logic value 1, (5 Volts), the NPN transistor is closed and the LED in series with the NPN transistor lights up. When the gate output goes from logic value 1 to logic value 0, (5 volts to 0 volts), the current reverses direction and the NPN transistor opens as the PNP transistor closes. This turns off the LED in series with the NPN transistor and lights up the LED in series with the PNP transistor. My transistor gates have the same dual logic as the gates in ICs. While the output of the gate is logic value 1, (5 Volts), the NPN transistor is closed and the LED in series with the NPN transistor lights up. When the gate output goes from logic value 1 to logic value 0, (5 volts to 0 volts), the current reverses direction and the NPN transistor opens as the PNP transistor closes. 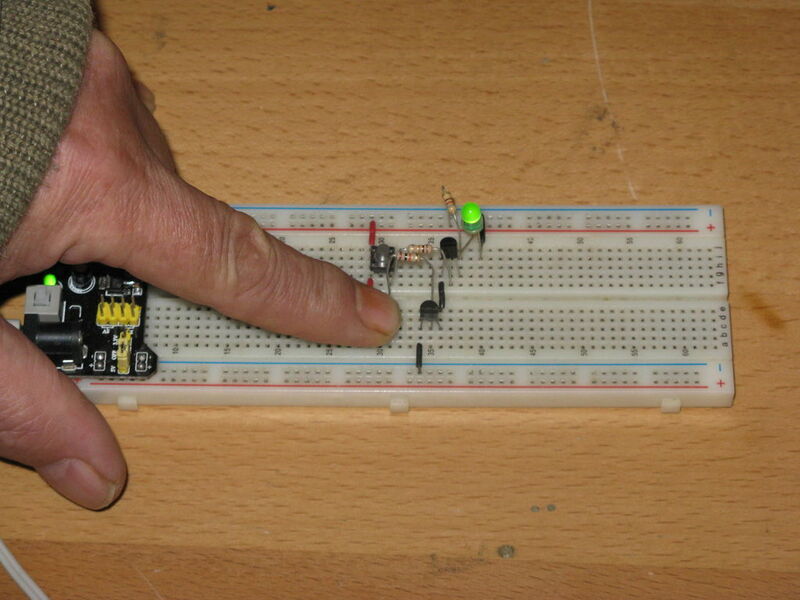 This turns off the LED in series with the NPN transistor and lights up the LED in series with the PNP transistor. Not or Inverter gate is the first of the 3 gates needed to make the other 5 gates. When the input, (A) of the Inverter gate is 0 or 0 volts the NPN transistor is open and the output, (Q) is 1 or +5 volts and any positive current goes out of the output (Q). When the input, (A) of the Inverter gate is 1 or +5 volts the NPN transistor is closed and the output, (Q) is 0 or 0 volts and any positive current goes to ground through the transistor. The Nand gate is the second of the three gates needed to make the other 5 gates. When the inputs, (A and B) of the Nand gate is 0 or 0 volts both of the NPN transistors are open and the output, (Q) is 1 or +5 volts and any positive current goes out of the output (Q). When the input, (A) of the Nand gate is 1 or +5 volts the NPN transistor on A input is closed. And when the input, (B) of the Nand gate is 0 or 0 volts the NPN transistor on B input is open and the output, (Q) is 1 or +5 volts and any positive current goes out of the output (Q). When the input, (A) of the Nand gate is 0 or 0 volts the NPN transistor on A input is open. And when the input, (B) of the Nand gate is 1 or +5 volts the NPN transistor on B input is closed and the output, (Q) is 1 or +5 volts and any positive current goes out of the output (Q). When the inputs, (A and B) of the Nand gate is 1 or +5 volts the both of the NPN transistors are closed and the output, (Q) is 0 or 0 volts and any positive current goes to ground through the transistors. The Nor gate is the third of the three gates needed to make the other 5 gates. When the inputs, (A and B) of the Nor gate is 0 or 0 volts both of the NPN transistors are open and the output, (Q) is 1 or +5 volts and any positive current goes out of the output (Q). When the input, (A) of the Nor gate is 1 or +5 volts the NPN transistor on A input is closed. And when the input, (B) of the Nor gate is 0 or 0 volts the NPN transistor on B input is open and the output, (Q) is 0 or 0 volts and any positive current goes to ground through the transistor on A input. When the input, (A) of the Nor gate is 0 or 0 volts the NPN transistor on A input is open. And when the input, (B) of the Nor gate is 1 or +5 volts the NPN transistor on B input is closed and the output, (Q) is 0 or 0 volts and any positive current goes to ground through the transistor on B input. When the inputs, (A and B) of the Nor gate is 1 or +5 volts the both of the NPN transistors are closed and the output, (Q) is 0 or 0 volts and any positive current goes to ground through both of the transistors. A Buffer uses two of the same gates; two Not or Inverter gates in series. When the input, (A) of the first Inverter gate is 0 or 0 volts the NPN transistor is open and the output, is 1 or +5 volts to the input of the second inverter. When the input of the second Inverter gate is 1 or +5 volts the NPN transistor is closed and the output, (Q) is 0 or 0 volts and any positive current goes to ground through the transistor. When the input, (A) of the first Inverter gate is 1 or +5 volts the NPN transistor is closed and the output, is 0 or 0 volts to the input of the second inverter. When the input of the second Inverter gate is 0 or 0 volts the NPN transistor is open and the output, (Q) is 1 or +5 volts and any positive current goes out the output (Q). The And gate is a Nand gate and a Not or Inverter gate in series. The inputs are the same as the Nand gate however the output is reversed by the Not or Inverter gate. When the inputs, (A and B) of the And gate is 0 or 0 volts both of the NPN transistors are open, the output of the first gate is 1 or +5 volts. When the input of the Inverter gate is 1 or +5 volts the NPN transistor is closed and the output, (Q) is 0 or 0 volts and any positive current goes to ground through the transistor. When the input, (A) of the And gate is 1 or +5 volts the NPN transistor on A input is closed. And when the input, (B) of the And gate is 0 or 0 volts the NPN transistor on B input is open, the output of the first gate is 1 or +5 volts. When the input of the Inverter gate is 1 or +5 volts the NPN transistor is closed and the output, (Q) is 0 or 0 volts and any positive current goes to ground through the transistor. When the input, (A) of the And gate is 0 or 0 volts the NPN transistor on A input is open. And when the input, (B) of the And gate is 1 or +5 volts the NPN transistor on B input is closed, the output of the first gate is 1 or +5 volts. When the input of the Inverter gate is 1 or +5 volts the NPN transistor is closed and the output, (Q) is 0 or 0 volts and any positive current goes to ground through the transistor. When the inputs, (A and B) of the Nand gate is 1 or +5 volts the both of the NPN transistors are closed and the output of the first gate is 0 or 0 volts. When the input of the Inverter gate is 0 or 0 volts the NPN transistor is open and the output, (Q) is 1 or +5 volts and any positive current goes out the output (Q). The Or gate is a Nor gate and a Not or Inverter gate in series. The inputs are the same as the Nor gate however the output is reversed by the Not or Inverter gate. When the inputs, (A and B) of the Or gate is 0 or 0 volts both of the NPN transistors are open, the output of the first gate is 1 or +5 volts. When the input of the Inverter gate is 1 or +5 volts the NPN transistor is closed and the output, (Q) is 0 or 0 volts and any positive current goes to ground through the transistor. When the input, (A) of the Or gate is 1 or +5 volts the NPN transistor on A input is closed. And when the input, (B) of the Nor gate is 0 or 0 volts the NPN transistor on B input is open and the output of the first gate is 0 or 0 volts. When the input of the Inverter gate is 0 or 0 volts the NPN transistor is open and the output, (Q) is 1 or +5 volts and any positive current goes out the output (Q). When the input, (A) of the Or gate is 0 or 0 volts the NPN transistor on A input is open. And when the input, (B) of the Nor gate is 1 or +5 volts the NPN transistor on B input is closed and the output of the first gate is 0 or 0 volts. When the input of the Inverter gate is 0 or 0 volts the NPN transistor is open and the output, (Q) is 1 or +5 volts and any positive current goes out the output (Q). 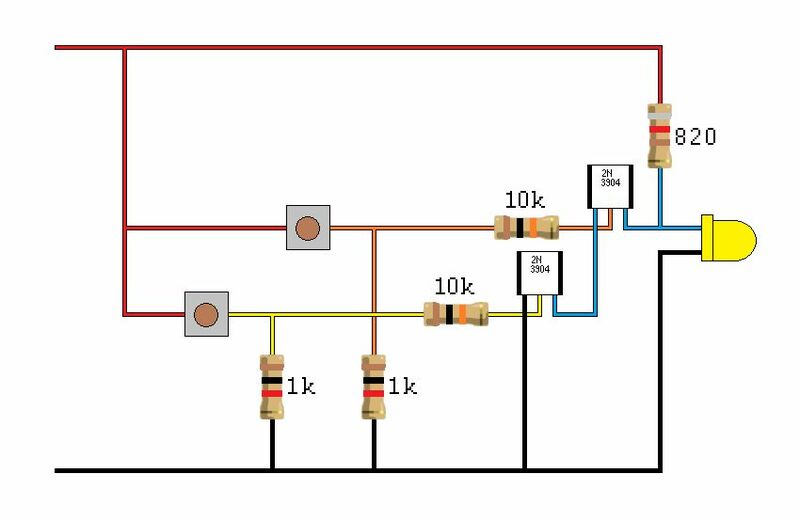 When the inputs, (A and B) of the Or gate is 1 or +5 volts the both of the NPN transistors are closed and the output of the first gate is 0 or 0 volts. When the input of the Inverter gate is 0 or 0 volts the NPN transistor is open and the output, (Q) is 1 or +5 volts and any positive current goes out the output (Q). The Exclusive Nor gate is configured as two Nand gates connected in parallel as a Nor gate with the two top transistors PNP transistors. When the inputs, (A and B) of the Xnor gate is 0 or 0 volts both of the NPN transistors are open and both the PNP transistors are closed. The output, (Q) is 1 or +5 volts and any positive current goes out of the output (Q). When the input, (A) of the Xnor gate is 1 or +5 volts the NPN transistor on A input is closed and the PNP transistor is open. With the input, (B) of the Xnor gate is 0 or 0 volts the PNP transistor on B input is closed and the NPN transistor is open. The output, (Q) is 0 or 0 volts and any positive current goes to ground through the closed transistors. When the input, (A) of the Xnor gate is 0 or 0 volts the NPN transistor on A input is open and the PNP transistor is closed. With the input, (B) of the Xnor gate is 1 or +5 volts the PNP transistor on B input is open and the NPN transistor is closed. The output, (Q) is 0 or 0 volts and any positive current goes to ground through the closed transistors. When the inputs, (A and B) of the Xnor gate is 1 or +5 volts the both of the NPN transistors are closed and both the PNP transistors are open. The output, (Q) is 1 or +5 volts and any positive current goes out of the output (Q). The Exclusive Or gate; uses all three of the key gates, it is configured as two Nand gates connected in parallel as a Nor gate with the two top transistors PNP transistors and a Not or Inverter gate in series. The Xor gate inputs are the same as the Xnor gate however the output is reversed by the Not or Inverter gate. When the inputs, (A and B) of the Xnor gate is 0 or 0 volts both of the NPN transistors are open and both the PNP transistors are closed and the output of the first set of gates is 1 or +5 volts. When the input of the Inverter gate is 1 or +5 volts the NPN transistor is closed and the output, (Q) is 0 or 0 volts and any positive current goes to ground through the transistor. When the input, (A) of the Xnor gate is 1 or +5 volts the NPN transistor on A input is closed and the PNP transistor is open. With the input, (B) of the Xnor gate is 0 or 0 volts the PNP transistor on B input is closed and the NPN transistor is open, 0 or 0 volts to the input of the Inverter. When the input of the Inverter gate is 0 or 0 volts the NPN transistor is open and the output, (Q) is 1 or +5 volts and any positive current goes out the output (Q). When the input, (A) of the Xnor gate is 0 or 0 volts the NPN transistor on A input is open and the PNP transistor is closed. With the input, (B) of the Xnor gate is 1 or +5 volts the PNP transistor on B input is open and the NPN transistor is closed, 0 or 0 volts to the input of the Inverter. When the input of the Inverter gate is 0 or 0 volts the NPN transistor is open and the output, (Q) is 1 or +5 volts and any positive current goes out the output (Q). When the inputs, (A and B) of the Xnor gate is 1 or +5 volts the both of the NPN transistors are closed and both the PNP transistors are open When the input of the second Inverter gate is 1 or +5 volts the NPN transistor is closed and the output, (Q) is 0 or 0 volts and any positive current goes to ground through the transistor. I like your approach to the "digital" world. This is where it ended for me during my engineering years, I do not like micro-controllers but I LOVE truth tables and Boolean logic. Thank you for this. Negative logic is one of the reasons I'm not fond of circuit simulator programs. If you look at datasheets like the programmers do, they program the circuit simulator to run in positive logic like the datasheets. This is a problem when you build a circuit that uses negative logic. I would appreciate your feedback to my new project, i am using Schmitt trigger inverters, "OR" gates and Flip Flops to make a true bypass effect pedal selector for guitar players. Thanks. Schmitt trigger inverters make a great low power inverting op amp. so if you want a non inverting you need 2 in series and they will work with just a few mV. You could put the XOR's output pulled-down to the ground rather than being pulled-up to 5v. Isn't dual logic fun, and the output would be the same.